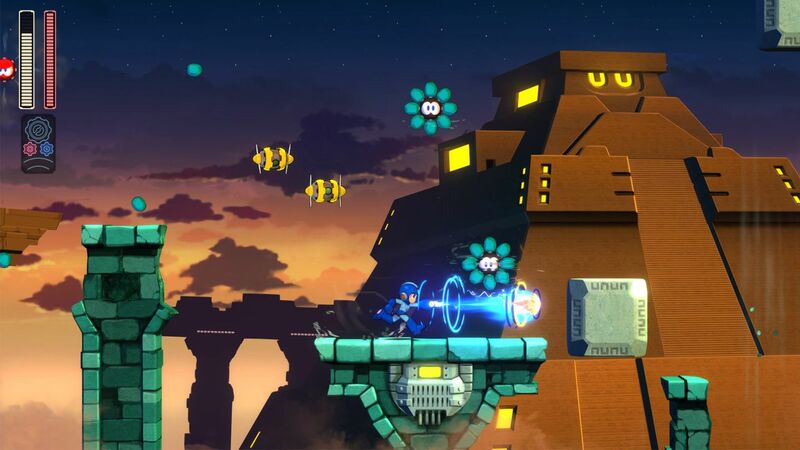 Mega Man is a series that has been looking into its past for far too long. It pretty much had to when no new games had been released for nearly a decade and most of the best ones had been released a solid 15-20 years before that, so celebrating the series' past was all fans really could do. 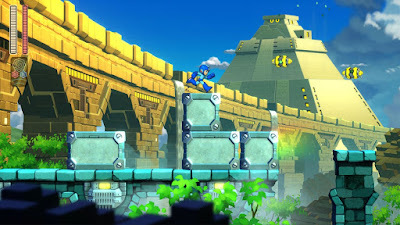 Finally, though, Capcom has decided to bring back Mega Man properly with a brand new adventure for the first time in forever with Mega Man 11. Mega Man 11 brings the classic series gameplay kicking and screaming into 2018 with mostly successful results. See all of the details here in our full Mega Man 11 review for PS4. Story specifics aside (because "yawn"), the basics are that you control a blue robot named Mega Man as he fights through 8 stages of enemy robots corrupted by the evil (or perhaps just misunderstood) Dr. Wily. At the end of the 8 stages (that you can choose to tackle in any order) you then play through four additional special stages before fighting Wily himself. This is pure and classic Mega Man at it's core, so it's so far, so good for Mega Man 11. The gameplay also starts out feeling very familiar for longtime series fans as well. 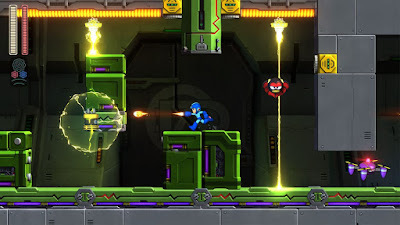 Mega Man 11 is a classic-style 2D action platformer where you (mostly) run left to right while shooting energy lemons at a myriad of enemy robots throughout a stage before ultimately fighting the boss robot of that stage. When you beat the boss robot you gain their weapon power, which can then be used against the other robot masters. Finding the boss weaknesses has always been the first order of business in a new Mega Man game, but in Mega Man 11 they are actually all surprisingly practical and you can figure out who to fight next based on the characteristics of the boss you just fought. Maybe that's how it's always been, but now I'm a mostly smart adult and not a dumb kid so things make more sense now. When the bosses are based on fire, ice, bombs, impacts, rubber, electricity, etc. it is pretty easy to figure out who should be susceptible to what. 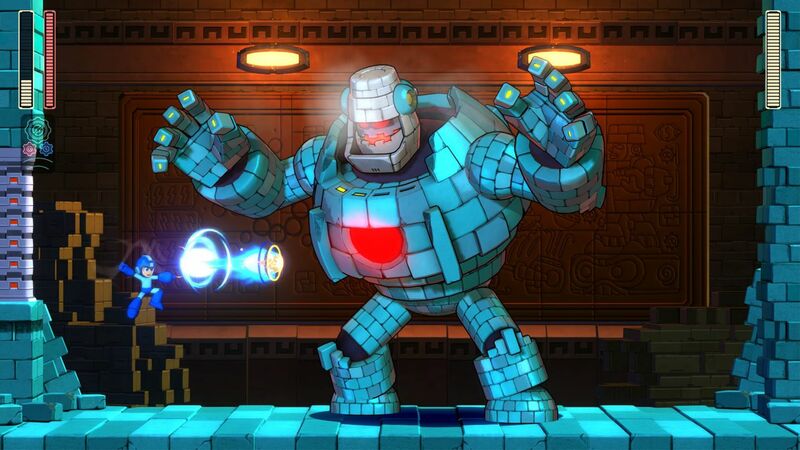 That's all par for the Mega Man course, but Mega Man 11 does introduce some new mechanics as well. First off is the Double Gear system that allows you to power up your shots or slow down time in order to help you with platforming through the levels and taking out enemies. The applications for both during are fairly obvious and certain sections of levels were definitely designed with them in mind. Another nice change is that Rush Coil and Rush Jet (to let you jump high or fly) are assigned to their own face buttons which makes them easier than ever to use. The gameplay overall feels really great. The platforming is precise, the boss fights make sense, and the new gear system is smartly implemented. 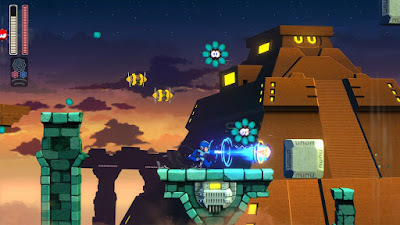 Another great change is that Mega Man 11 is packed with accessibility options and special items to adjust the difficulty to suit your skills or tastes. The easiest difficulty level gives you unlimited lives, lets you land on spikes without dying, saves you from bottomless pits, and has very friendly checkpoints. You can also buy items with in-game currency you collect to do things like automatically charge your Mega Buster, make your gear not use any meter, reduce damage taken, and more. Thanks to this, players of virtually any skill level or ability will be able to see everything the game has to offer. It also makes for a great way to practice boss encounters and learn patterns. You can play on normal difficulty and turn off all of these options if you want, of course, but I'm super glad they're here so pretty much anyone can play through the game and have a good time. Mega Man 11 does stumble in a few key areas too, unfortunately. The levels are surprisingly long and have some steep difficulty spikes that can be frustrating. Each level also has distinct gimmicks based on the robot master of the level, but they are mostly just annoying and are tremendously overused. Previous Mega Man games had level gimmicks too, of course, but never to the overbearing extent that they are featured in Mega Man 11. Bounce Man's stage in particular is just putrid thanks to a poorly thought out "everything is made of bouncy balls!" concept. Whenever the stages just let you jump and shoot like a normal Mega Man game they're great, but when the gimmicks pop up (far too often) those sections are far less enjoyable. I think my biggest issue with Mega Man 11 is that is incredibly conservative to the point that nothing really stands out as being particularly memorable. It is like Capcom just wanted to get the Mega Man name out there with this one and not rock the boat too much. It does things well, certainly, but nothing mind blowing that stands out as above and beyond what we've seen in any other Mega Man titles. A good example of this is that the music, which is usually a standout in Mega Man games, is totally forgettable, which is really disappointing for me. The visual presentation is kind of disappointing as well. It just doesn't really stand out. The designs are fairly simple and the backgrounds are simple. 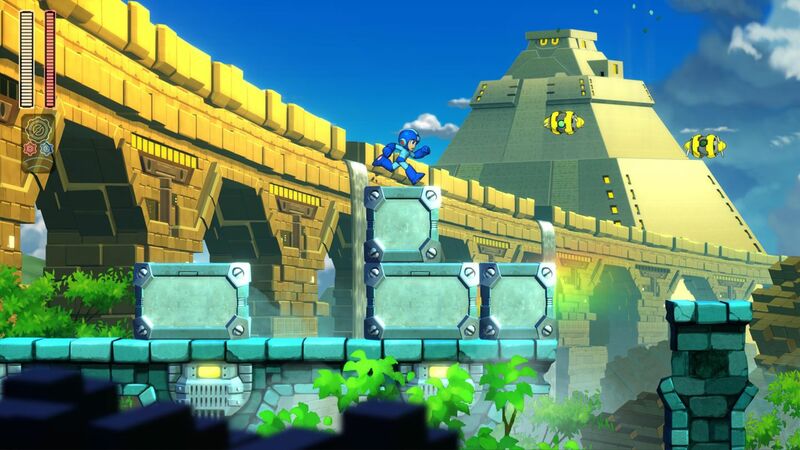 You could take Mega Man out of the screenshots and it would be hard to tell if this was a Capcom developed title or yet another indie 2D platformer. The game does run buttery smooth, though, thankfully. All in all, Mega Man 11 is a good first step in bringing the franchise back and introducing it to a new generation of gamers but I think longtime fans will feel a little underwhelmed with it. It plays great and feels good and introduces some fantastic new features, and I love the difficulty options, but it just doesn't ever really wow you. It is by the numbers and conservative and safe and ultimately kind of forgettable. With that said, there is no doubt in my mind that for younger players that have never seen a Mega Man game before, Mega Man 11 is a perfect place to start and I highly recommend it for that audience. Older, more experienced, Mega Man fans will still enjoy it, but lower your expectations a bit.